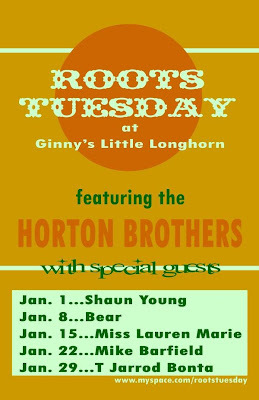 We play every Tuesday night at a place called Ginny's Little Longhorn here in Austin, TX. We back up different people that we've worked with over the years. This is a good month--Shaun Young made an appearance and later this month we'll be backing up Mike Barfield and T Jarrod Bonta. Oh, and the usual suspects--Bear and Miss Lauren Marie--will be takin' turns this month as well. Johnny Horton--Live in Waco--75 Cents!